"The ship which sailed from Liverpool on Independence Day - Friday, July 4th- 1844, was the Britannia, one of four paddle steamers built on the Clyde. The Britannia was built by Robert Duncan, and was fitted with side-lever engines by Robert Napier. She was 207ft long by 34ft. 4in. broad, with a moulded depth of 24ft. 4in., and her gross tonnage was about 1154 tons. A cargo capacity of 225 tons, with accommodation for 115 cabin passengers, was provided. Her engine were designed to develop 740 indicated horse-power, giving an average speed of 81/2 knots on a coal consumption of 38 tons per day, and the voyage to Boston lasted 14 days and 8 hours. It is interesting to compare the 1154 gross tons of the Britannia with the 52,117 gross tons of the modern Berengaria, and her speed of 81 knots with the record 27-knot performance of the Mauretania of 4 days 10 hours and 41 minutes for the voyage from Queenstown to New York." The hull of RMS Britannia was built by Robert Duncan under subcontract to Robert Napier. 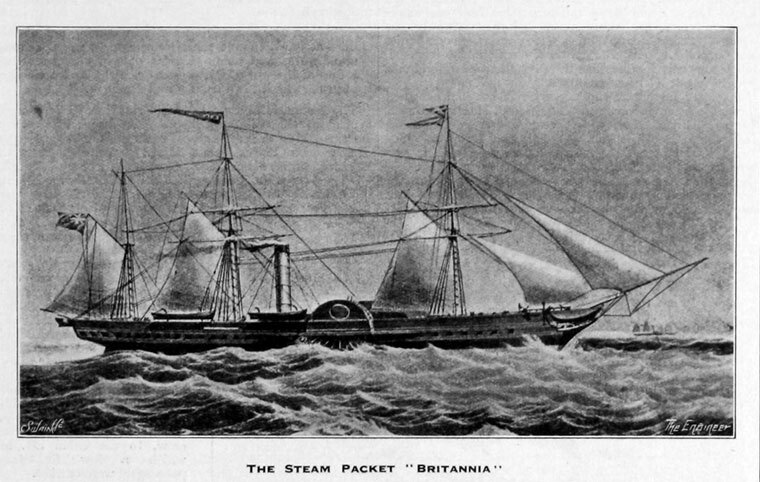 The Britannia opened the North Atlantic mail service for the British and North American Royal Mail Steam Packet Company. This page was last edited on 10 August 2015, at 09:13.